It had rained a bit overnight and it felt like a new front was moving in and chasing out with it the one week of incredible July-like weather we had in late September. There would be a few raindrops and some wind to paddle into as we made our way to Hartley Bay, less than nine kilometers away. We could have exited the afternoon before but we had luckily slowed down. The reward had been an afternoon and evening of stunning views from CS 633 hilltop as the sun sank below the line of the trees to the west. The other guys sharing the campsite with us – Hugo, Ian, Jacquelin, and Yannik – were staying for another night before their ride back to la belle province. As we paddled away I yelled up to them “A la prochaine!” This was not their first visit and we figure it won’t be our only one either! 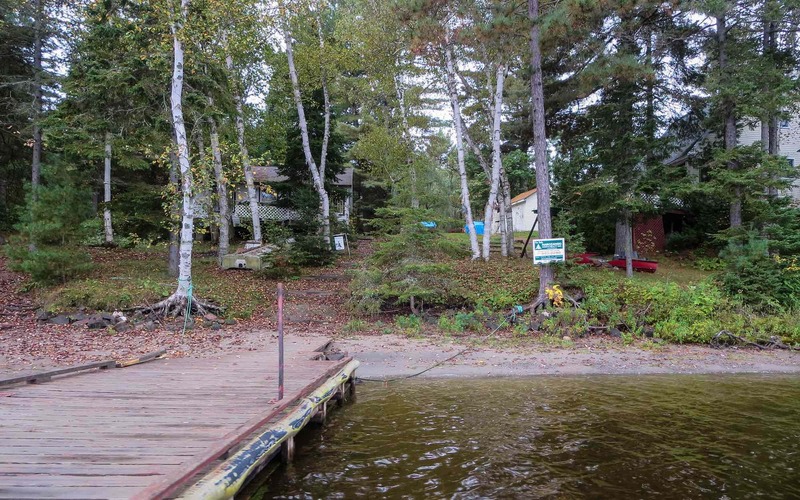 Across Ox Bay and through the Canoe Bay Channel past a “For Sale” property with a lodge with a number of cabins on it and then north up Wannapitei Bay. As we approached the entrance to Hartley Bay I wondered if the woman who was sitting on the sofa when we passed by at the beginning of the trip would be there. Well, given the weather probably not! 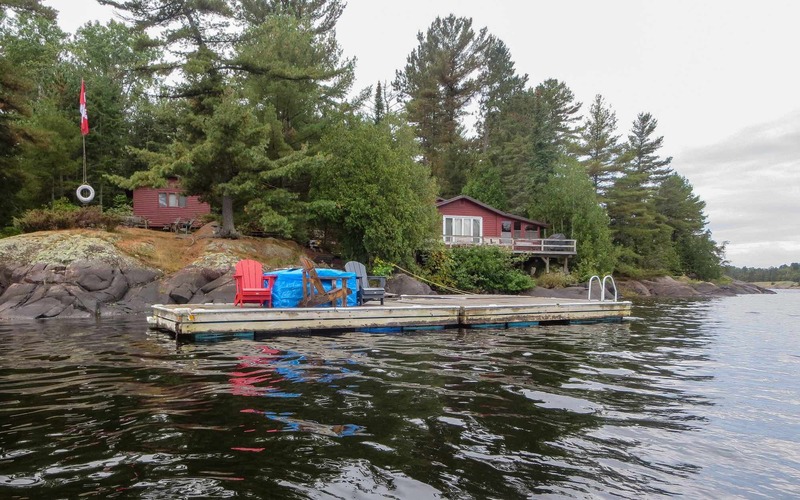 She had said, “Everybody knows to turn left after the dock with the sofa!” As we passed by the dock we saw the Muskoka chairs. As for the sofa, it was wrapped in a blue tarp to keep it dry until their return. A bit further along the south side of Hartley Bay, we passed another property with a “For Sale” sign on it. We wondered how much the owners were asking; when I got home I googled the answer – $249,000. See here for the listing. Nearing the Hartley Bay Marina dock we noticed a lot of activity. Above the dock was a trailer with eight canoes on it; people were carrying bags and gear down to the dock. 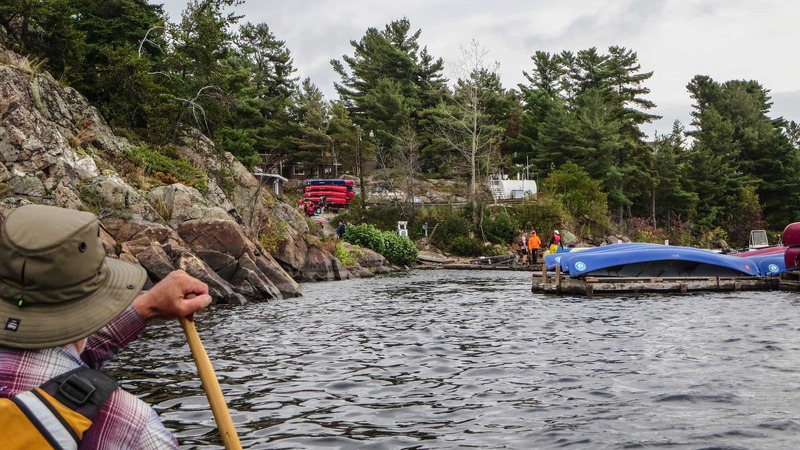 As our canoe came out of the water their red Nova Crafts were going in. We were looking at a group of high school students from Sudbury at the start of their canoe trip to Georgian Bay and back. I complimented the teachers in charge for making the trip happen. The responsibility – and the paperwork – to organize a trip like this these days can be daunting. They were pros who had done this a dozen times and appeared to have everything under control! 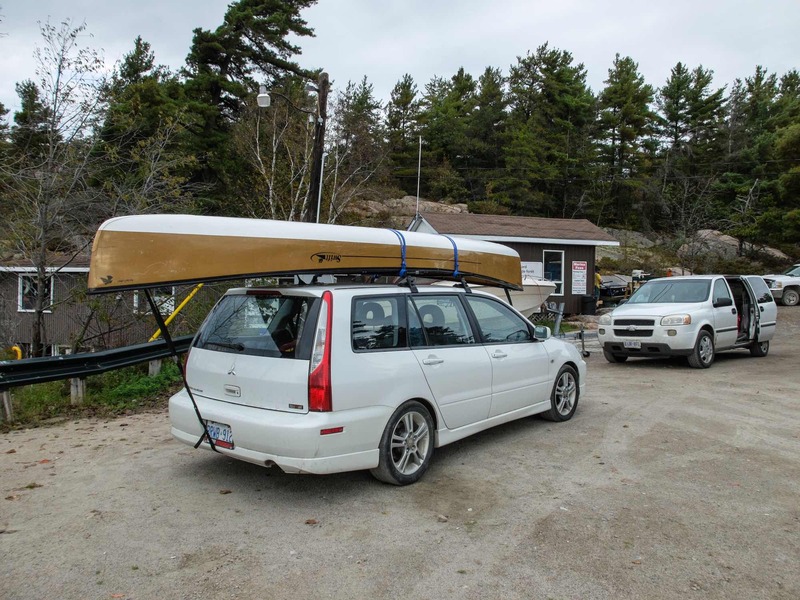 We got the Hooligan canoe packs and duffel bags and paddles into the car and then strapped down the canoe. Finally, we grabbed the bags with the clothes and shoes we had worn on the way up and did a quick change. Gone were the Tilleys! We were back in street clothes and set for the Grand Portage home! But first – a bill to settle. 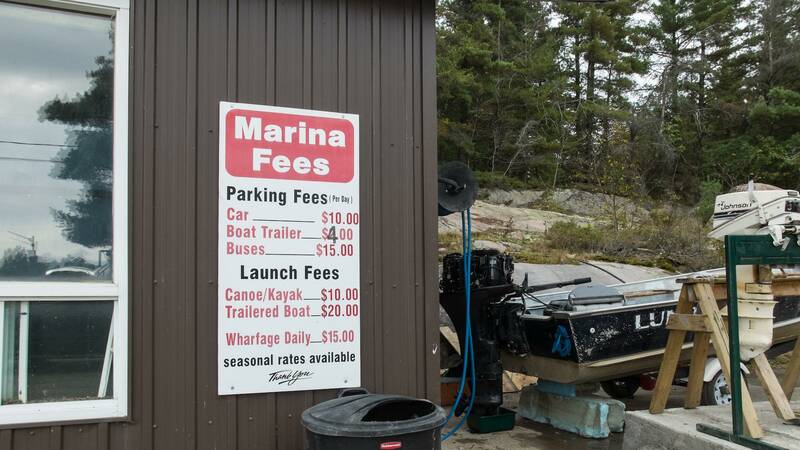 We had already paid the park permit fees on our arrival at Hartley Bay Marina. Now we settled the parking and launch fee – 6 days x $10. + $10. + HST. While free is always better, the marina makes for the most convenient entry point and safest place to leave your vehicle sitting for a week. It really is a minor expense given the memorable trip you end up having. We did the 14-kilometer drive back to Highway 69 and headed south. We had one more stop to make before we headed south to Parry Sound. 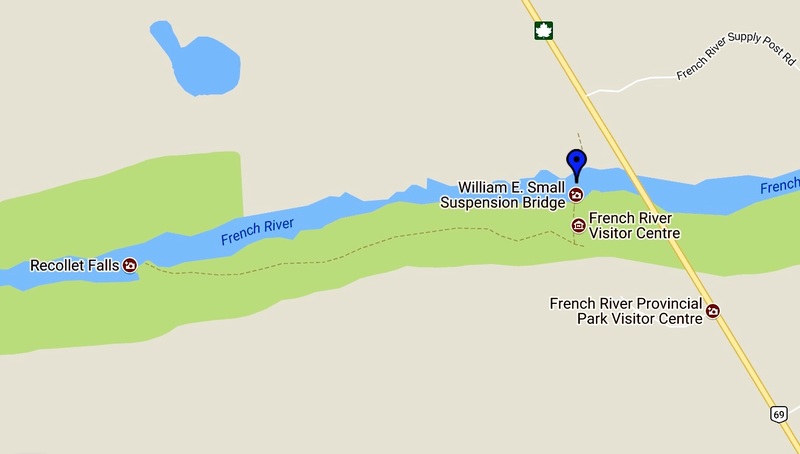 As we drove across the French River bridge we took the exit to the French River Park Visitor Center. 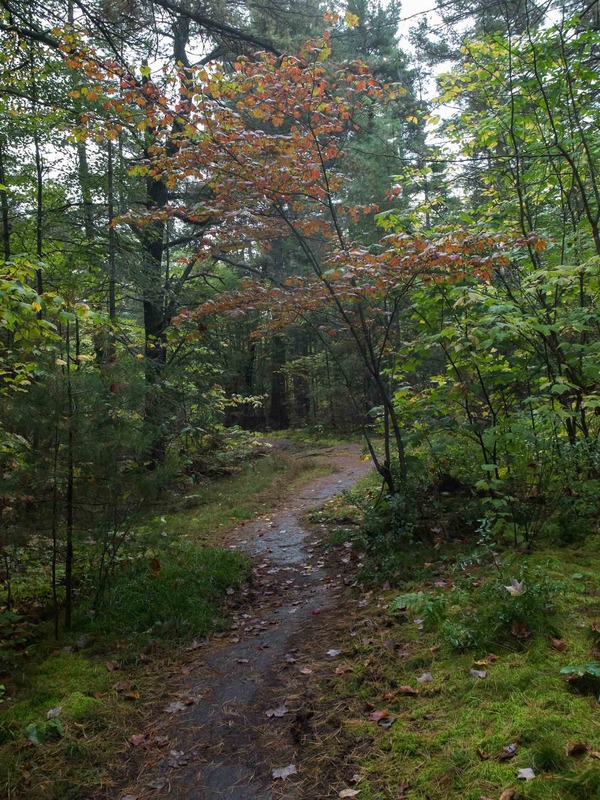 A visit to the displays in the Visitors’ Center itself and then a walk down to Recollet Falls were on tap. 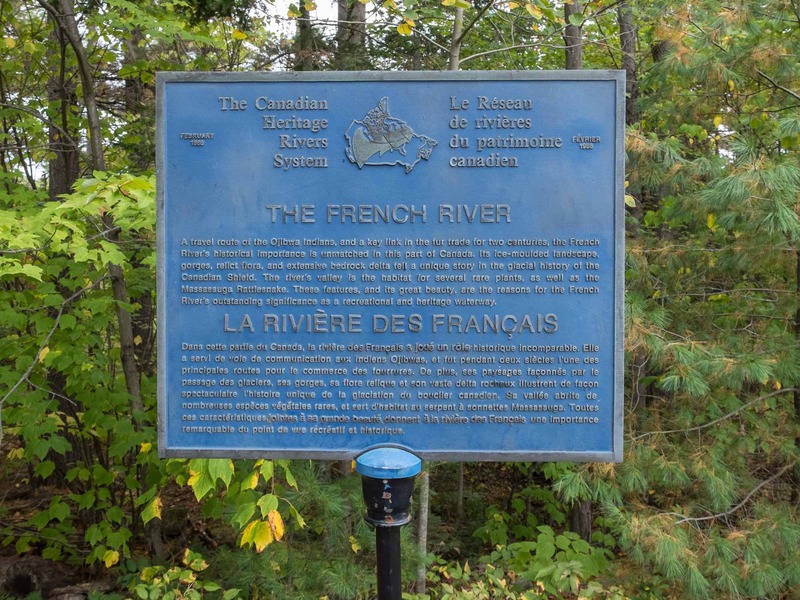 As we walked from the parking lot to the Center we passed a collection of historical plaques celebrating various aspects of the French River story. Unfortunately, the center is closed on Wednesdays in September so no visit! 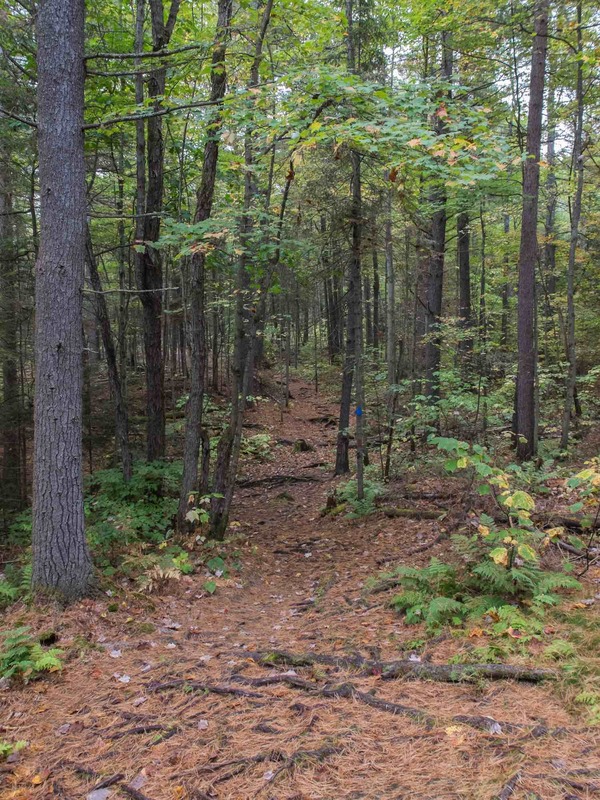 We turned around for the trailhead to Recollet Falls. 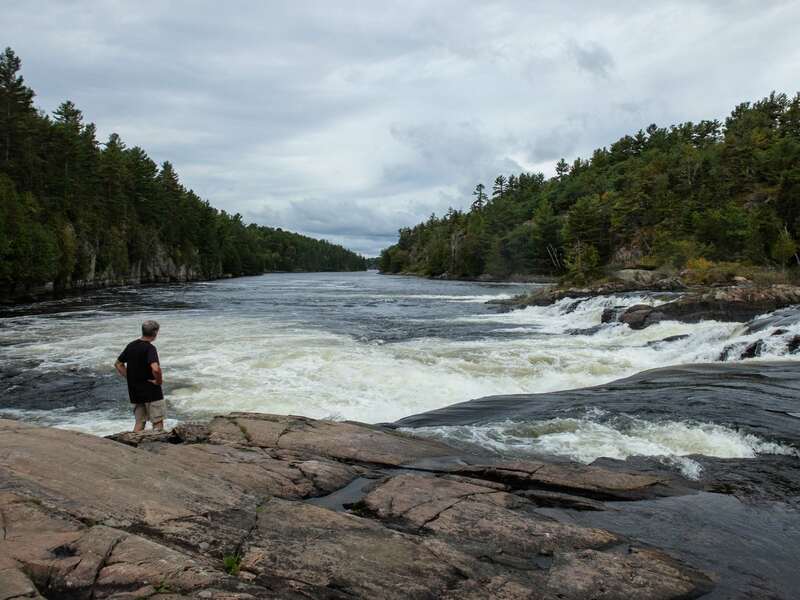 A pleasant twenty-five minute walk on a path that occasionally got a bit rough and we were standing at the top end of the falls and looking at the short portage trail on river left that would have taken the voyageurs and their precious cargo around. Above the falls on river right was a long stretch of vertical rock. 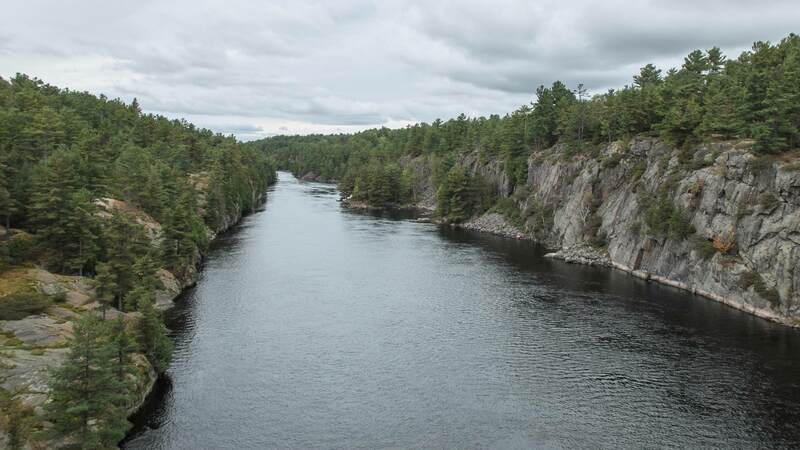 I had learned that one of the French River’s four pictograph sites was somewhere over there but without getting much closer and taking the time to really look we would not be seeing it. Apparently, it is a painting of a single standing human figure with a couple of ochre slash marks next to it. 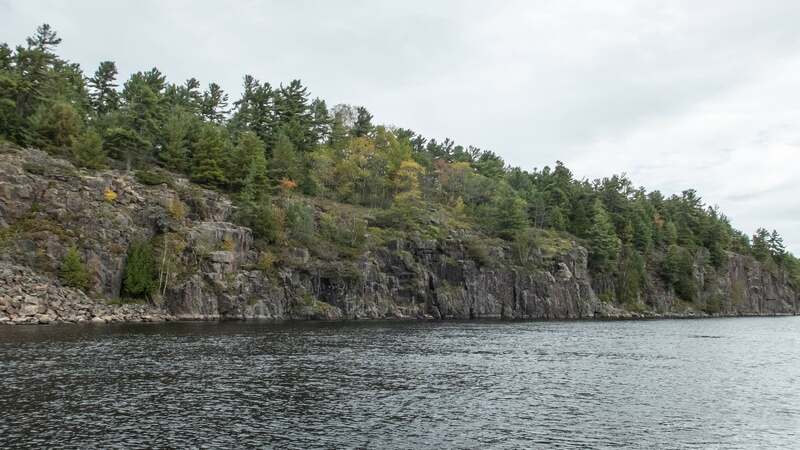 Maybe some other time we’ll paddle down from the other side of Highway 69, first checking out the other site just above the highway before floating down to the one above Recollet Falls. 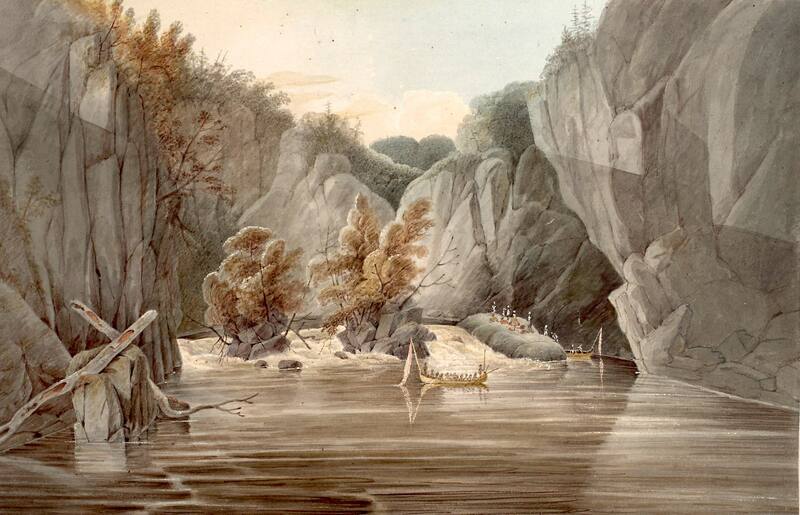 In the early 1820’s John Elliott Woolford, an English landscape painter, had come down the river in the service of British North America’s then-Governor-General, the Earl of Dalhousie. 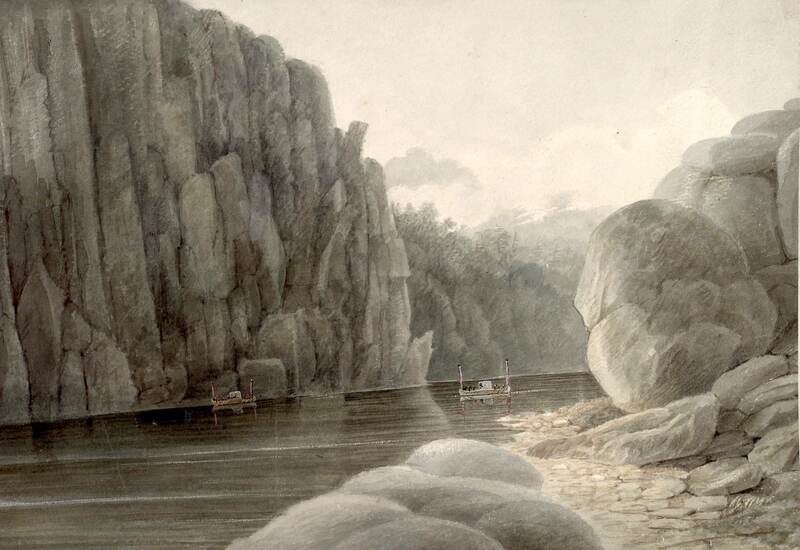 What he eventually put on a canvas titled “Above Recollet Falls” elevated the rock face along the river banks to a whole new level! 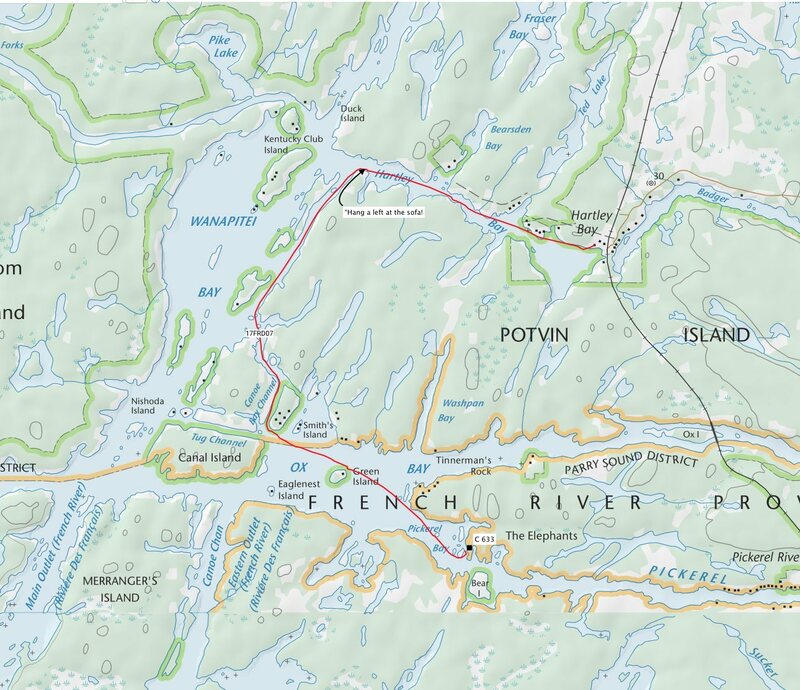 The French River travels straight down to the Ox Bay that we had paddled earlier this morning. 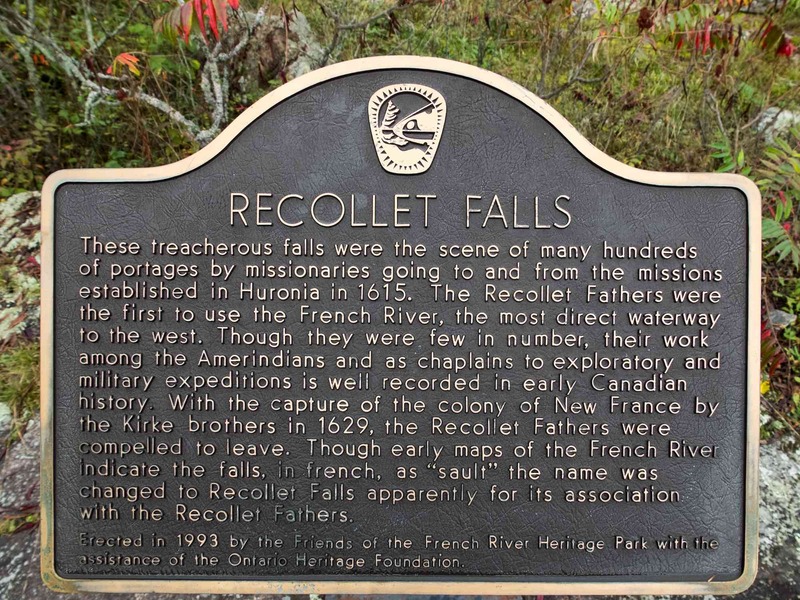 Having crossed the Highway 69 bridge in a car a hundred times it was neat to stand at the falls and experience it in a way that was easier to connect to the voyageurs of old and the Recollet and Jesuit missionaries and Radisson, one of my childhood heroes. They had all come this way and the scene still looked much like the one they paddled into. 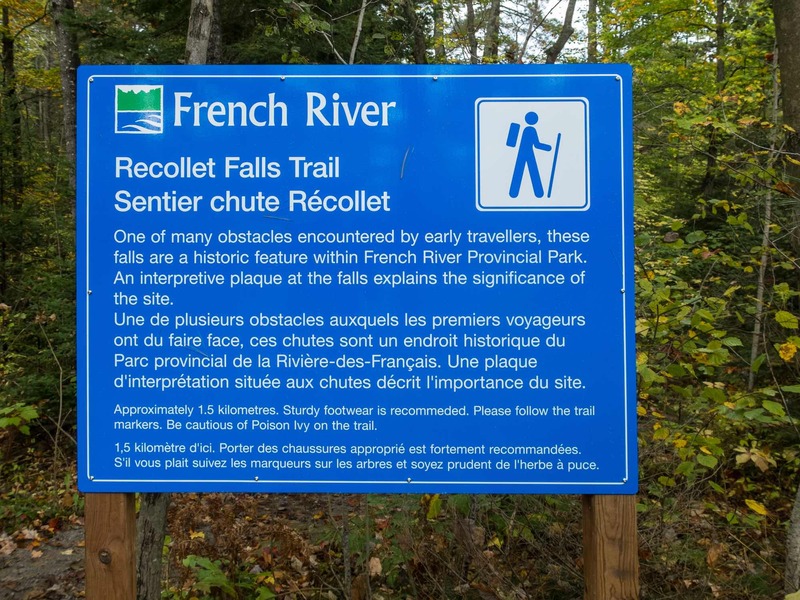 And then there is that other Woolford painting, “Fall of the Grand Recollet”, which presents the French River and Recollet Falls from below. It too shows that some artistic license has been taken! We followed the 1.5 km. trail and the blue markers back to the visitor center but before we headed to the car we walked behind the visitors’ center. The view of the center from there perhaps explains what people are getting at when they praise the structure for its architectural style because from the unimpressive front it looks like a rather ordinary shoebox. 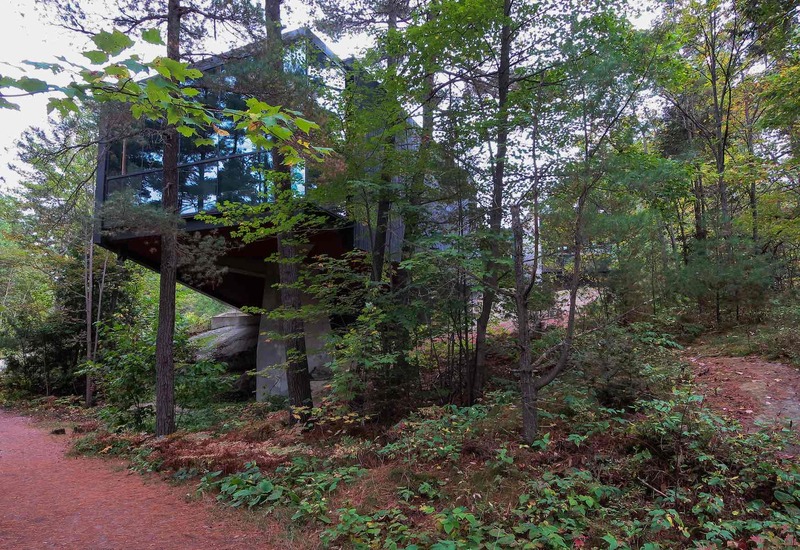 The all-glass back allows fine views of the nearby woods and the French River and the bridges crossing it. 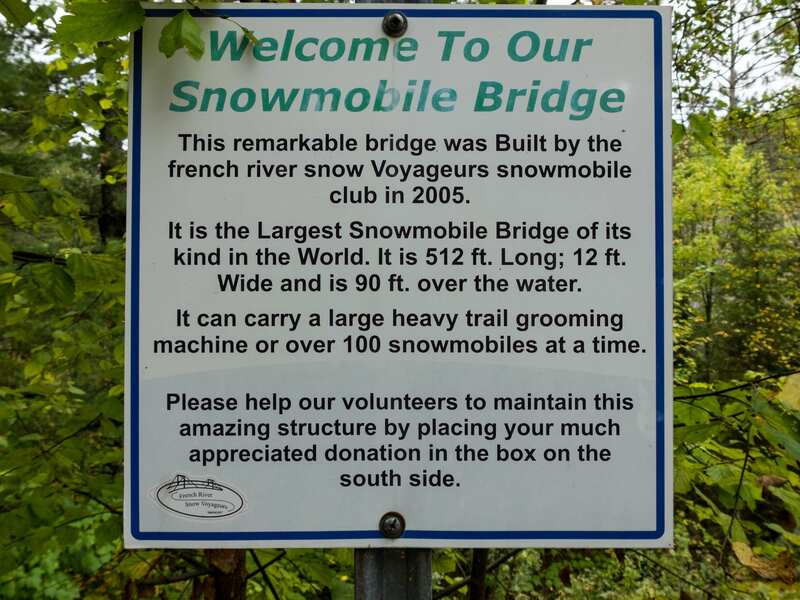 We were heading to one of those bridges – billed as a Snowmobile Bridge! 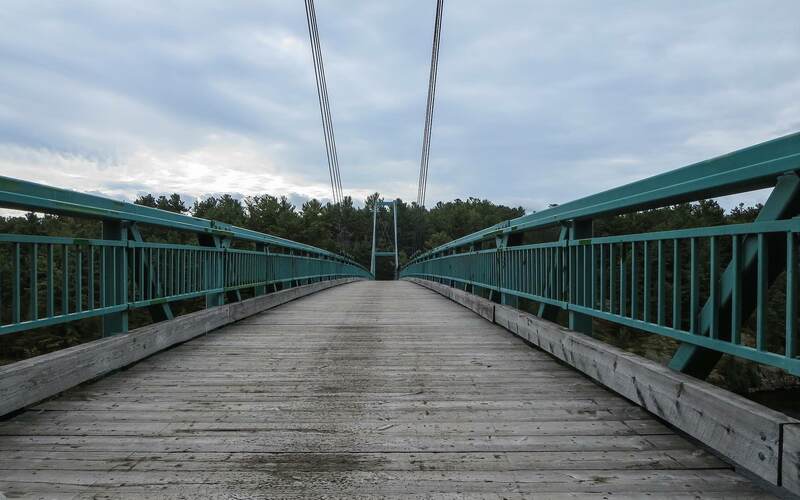 The bridge may have cost as much as the Visitors’ Center to build! I sure hope the snowmobilers get enough snow each year – and enough donations – to make the thing worthwhile. 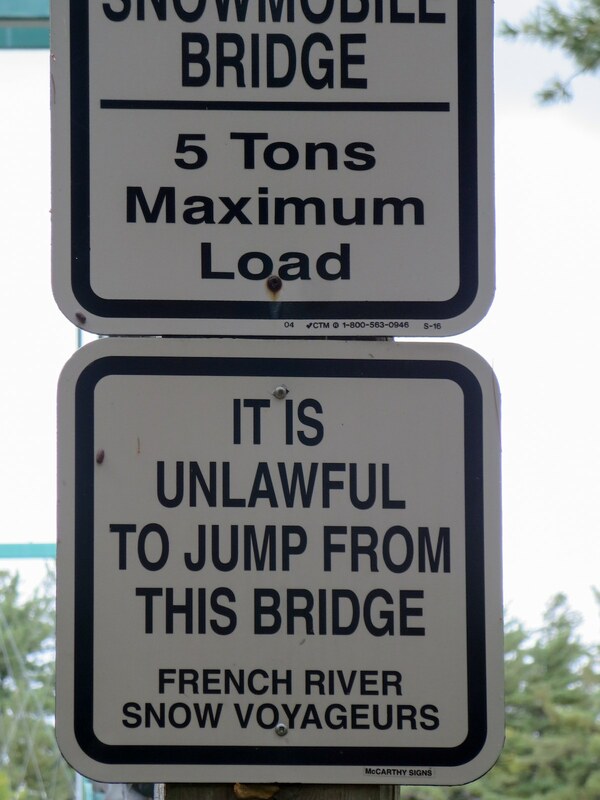 Sure enough, when I checked Youtube there was an iPhone upload of someone who had taken the sign as a prompt and jumped off the bridge into the river! Standing in the middle of the snowmobile bridge we got a classic view of the French as it completes its 110-kilometer run to Georgian Bay. 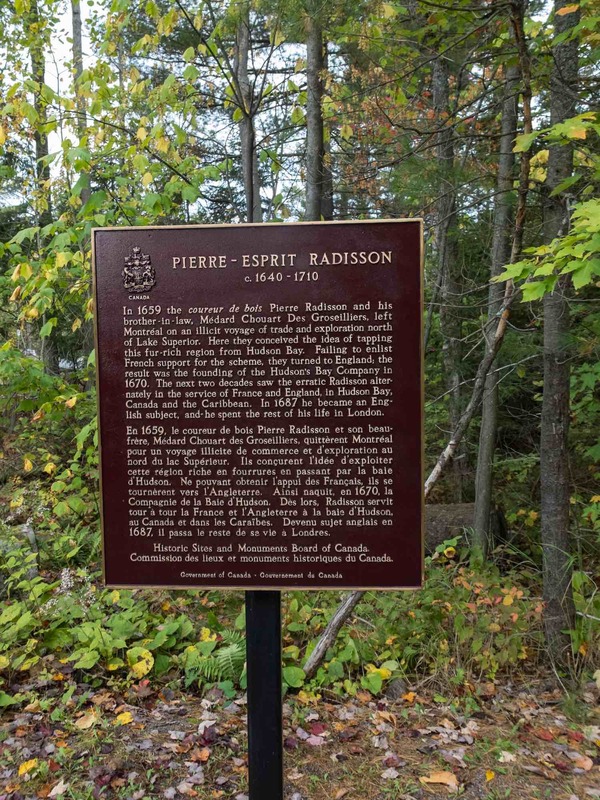 The photo above brought to mind a beautiful painting done by Sudbury-born (but now living in Killarney) artist Pierre AJ Sabourin. 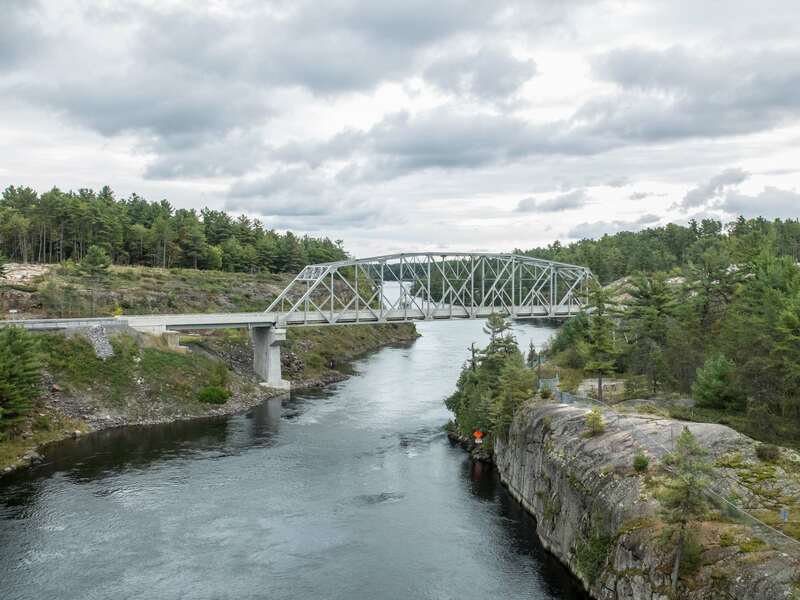 From his painting spot on the bridge, he has zoomed in somewhat and added a bit of vertical rock to river left and given it an updated Group of Seven “feel”. 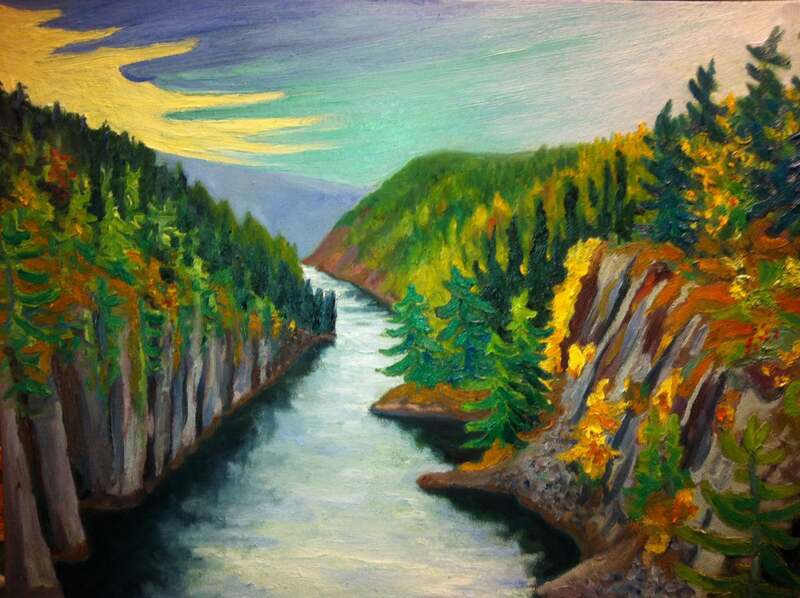 See Sabourin’s Wordpress website here for more about the artist and a sample of his work. We looked north to the Highway 69 bridge from the snowmobile bridge. And then it was time to hit the road! We left around noon. By 3:20 p.m. we were negotiating the express lanes of the 401 and then zipping down the Don Valley Expressway at the end of a fantastic one-week paddle. 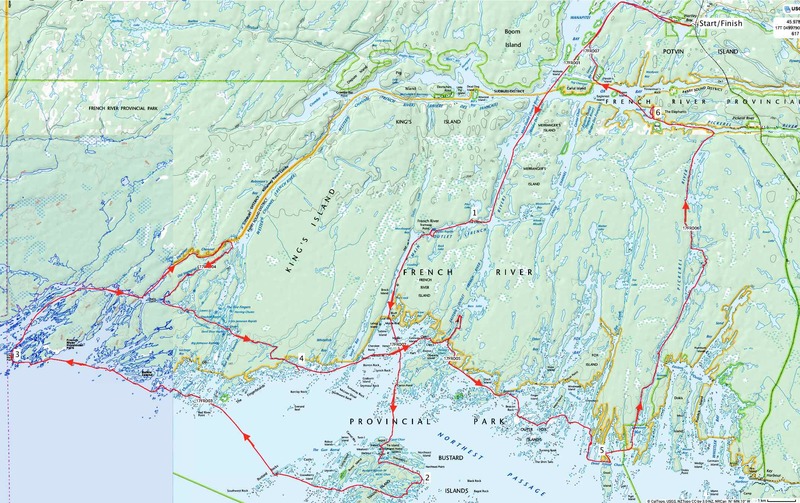 The French River Delta and the islands offshore make for a great place to go paddling during the off-season when there are few people in the Park. And to think it is only a 3 1/2 hour drive from T.O. to Hartley Bay! It’s a ride we’ll be doing again! Thanks for a wonderfully detailed post. 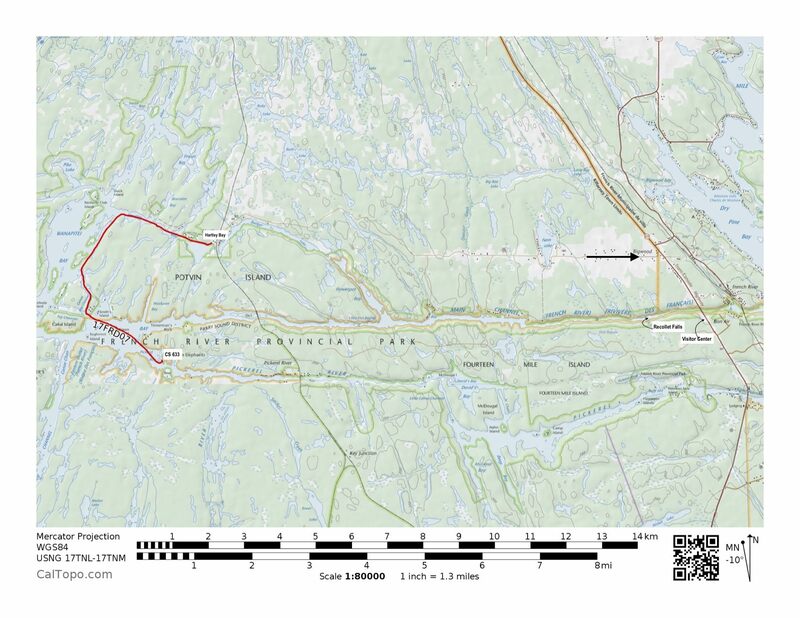 We’re planning our first trip trip to the French River Provincial Park and this has been a really helpful resource. Great photos and nice detailed trip notes. Much obliged! 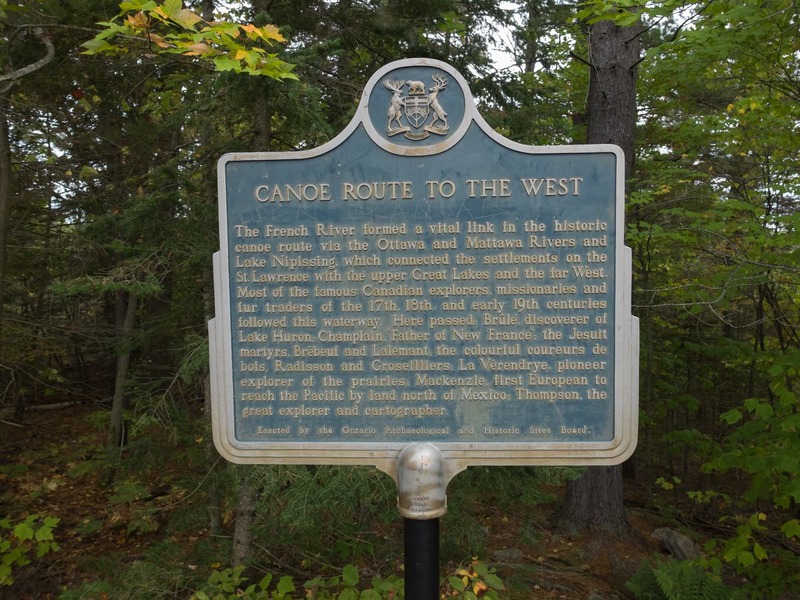 It is a great area for a one-week canoe trip – eye candy scenery and nice campsites and echoes from the past. Avoid high season and weekends and you will just have the weather to worry about! Enjoy your trip!